Arrange spinach on large serving plate. Slice tomatoes and arrange over spinach. Slice mozzarella and place on tomatoes. Sprinkle capers and black olives over plate. Mix juice and mustard; whip in oil gradually until emulsified; drizzle over all. Medium sized sliced tomatoes (even sliced Romas) work better. 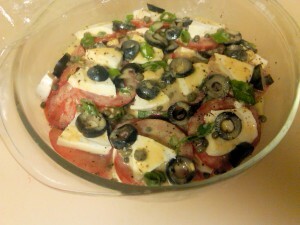 Layer in a large glass or Pyrex casserole: tomatoes, mozzarella cheese, black olives, capers, dressing; repeat until all in. Chill for couple hours, at least. Lay tortilla flat on pan – fry 5 -10 minutes while placing mashed potatoes on ONE HAL SIDE only . Add cheese on top . – Fold over tortilla after 5 -7 minutes and press down – this way its fried on both sides but you don’t need to flip it .